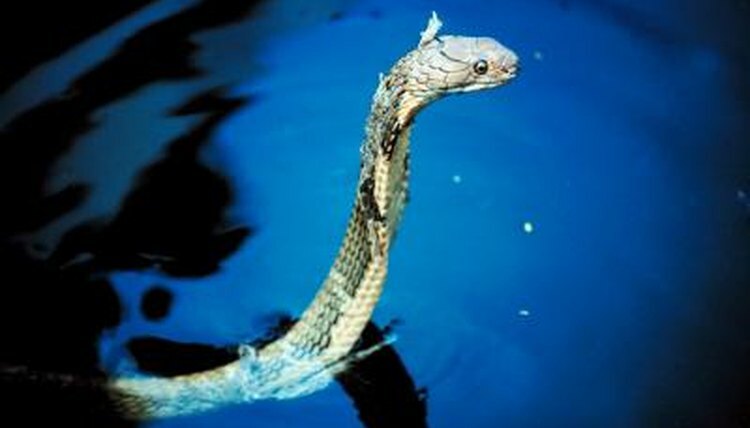 According to the World Health Organization, farmers working in the rice fields of tropical locations, such as Bali, are among those who are at most risk of venomous snakebite. However, Bali’s snakes -- even the venomous species -- are incredibly important to the health of the local ecosystems. As the habitat has changed and humans have killed more and more snakes from fear and for consumption, the rodent population is growing. Bali is a provincial island of Indonesia, about 750 miles southeast of the capital city of Jakarta and about 8 1/2 degrees south of the equator. Hot all year, Bali has a distinct rainy season from December to April and a dry season from May to November. Most of the island’s rice is grown on terraces cut into the southern slopes of the island, often using man-made drainage canals to access and control water as it pours down the mountains. Equatorial spitting cobras (Naja sputatrix) are one of the most commonly encountered venomous species in rice fields. Equatorial cobras are typically less than 5 feet long, while the longest venomous snakes in the world -- king cobras (Ophiophagus hannah) -- reach more than 14 feet in length and also prowl the rice fields of Bali. Rather than hunting for rodents and frogs like other cobras, the king cobra is ophiophagus -- a snake eater -- and enters the fields to hunt other snakes. Banded kraits (Bungarus candidus) are small -- rarely reaching 3 feet -- but deadly elapids, found throughout Bali. Keelbacks (Rhabdophis ssp.) are common in rice fields and, though they lack large fangs in the front of their mouths, they can deliver potent venom through enlarged rear teeth. Burmese pythons (Python bivittatus) are large constrictors that sometimes prowl the rice fields; occasionally they achieve 20 feet in length. Reticulated pythons (Python reticulatus) -- who also hunt in the rice fields -- are even longer, sometimes exceeding 25 feet, though most are between 10 and 14 feet. Small pythons feed on rodents, while large specimens add ducks and larger mammals to their menu. Indochinese ratsnakes (Ptyas korros) reach almost 7 feet in length and frequently hunt rice fields and other agricultural regions. Other non-venomous snakes occasionally found in Bali’s rice fields include radiated rat snakes (Coelognathus radiates) and white-banded wolf snakes (Lycodon subcinctus), the latter of which closely resembles the dangerous banded krait. Vine snakes (Ahaetulla ssp.) typically inhabit trees, but sometimes pursue frogs into rice fields. While commensal rodents are likely the most important prey source for snakes living in the rice fields, they are home to many other prey species as well. Frogs -- which serve as prey for keelback, mangrove and vine snakes -- are abundant, drawn to the standing water and numerous insects. Many bird species, which are also eaten by many snakes, inhabit the rice fields, some eating crops while others consume insects. The rice provides cover not only for snakes, but for their prey as well. Some farmers encourage or introduce fish to the water of the terraces; the fish convert algae and undesirable plants into fertilizer. What Is a Viper's Diet?